Detect outliers in denied traffic and view geographic hotspots for inbound traffic with pre-built dashboards and configurable alerts. Integrate Network Watcher analysis with the Sumo Logic Apps for Azure Web Apps and Azure Audit for a full view of your Azure environment. Get real-time analysis of network traffic flows to improve overall security posture and identify suspicious network traffic or important deviations. Azure Network Watcher is a network performance and diagnostic service that enables Azure Network monitoring. This service lets you collect “Network Security Group (NSG) Flow Logs”. NSG flows logs have 5-tuple information (source, destination, Traffic Flow, Traffic : Allowed/Denied) about ingress and egress IP traffic that are either blocked or allowed by the NSG, allowing you to troubleshoot traffic and security issues. 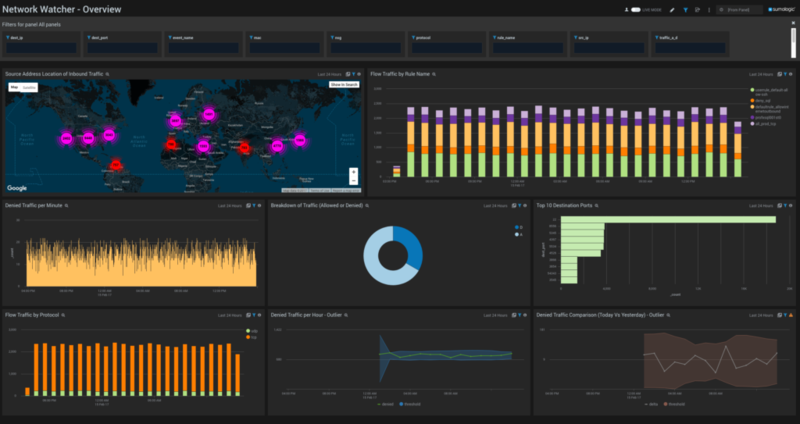 With the Sumo Logic App for Azure Network Watcher, you can gain real-time visibility into your Azure Network and get alerts on key metrics to rapidly identify problems and security issues. 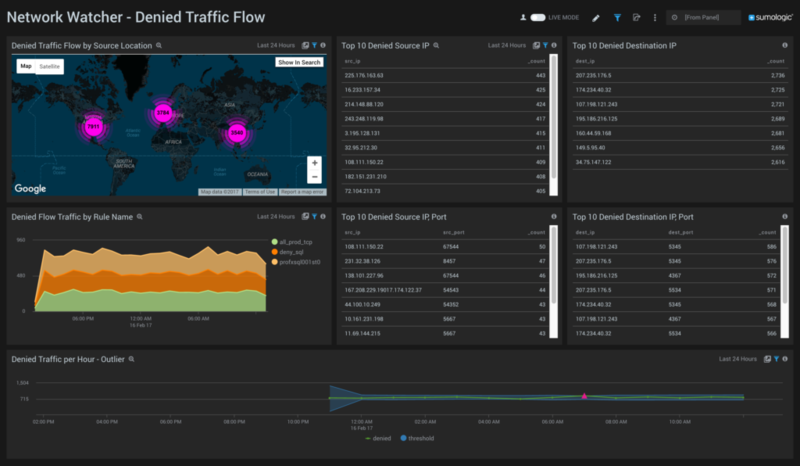 Use Sumo Logic’s interactive dashboards to get real-time visibility into NSG flow logs, including drill-down into queries with NIC, tuple, and traffic flow information. Use the app to detect outliers in denied traffic, view geographic hotspots for inbound traffic, and filter data by rule name, source/destination IP and port, and other metadata fields. |Sumo Logic's LogReduce™ technology takes log analysis to the next level by proactively identifying system, application, and user insights—even when a specific question was not asked. Watch the demo to learn more about how LogReduce simplifies millions of log lines into easily digestible patterns.